Roux-en-Y gastrojejunostomy is one of the reconstruction methods for the prevention of alkaline reflux gastritis, esophagitis, dumping syndrome, and carcinogenesis of the gastric remnant. However, some patients who receive Roux-en-Y gastrojejunostomy suffer from the Roux stasis syndrome. To prevent this syndrome, a new type of reconstruction, called the uncut Roux-en-Y technique, has been reported. 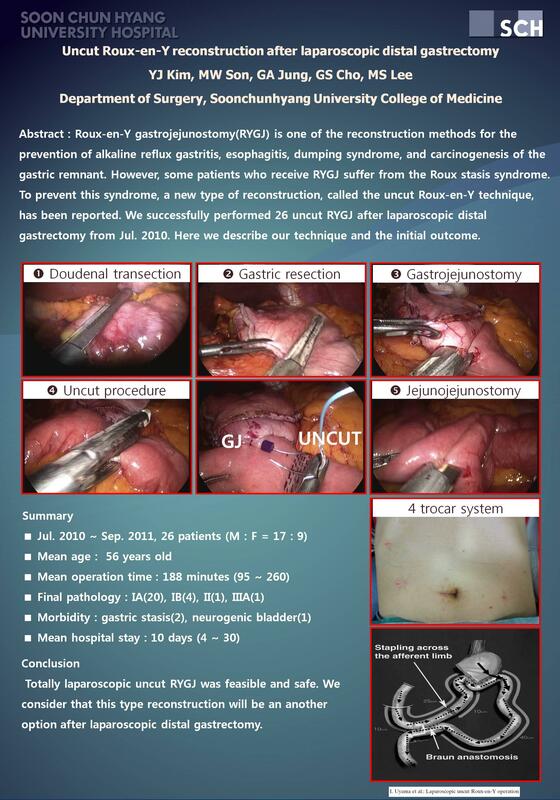 We successfully performed 24 uncut Roux-en-Y gastrojejunostomies after laparoscopic distal gastrectomy. Here we describe our technique and the initial outcome.